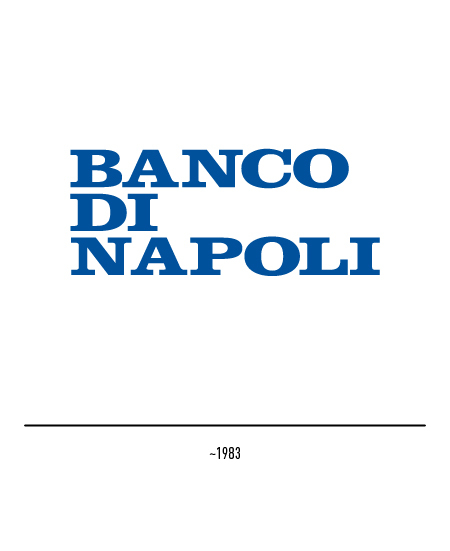 The Banco di Napoli is today a modern public bank but its origins date back at least to the foundation of the "Sacro Monte di Pietà" in Naples in 1539. 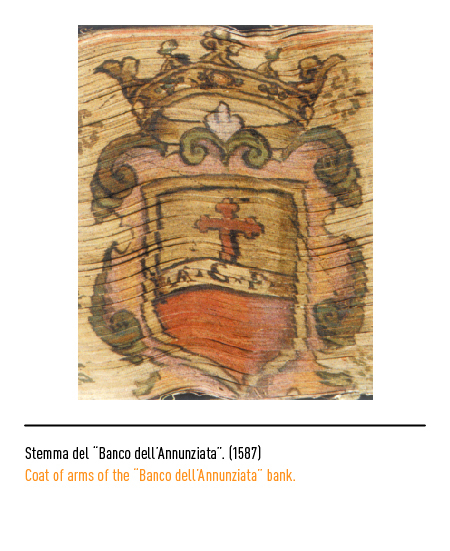 Recent studies suggest an even ealier origin, perhaps as far back as 1463 to the "Cassa Santa dell'Annunziata", a people's savings and loan bank. 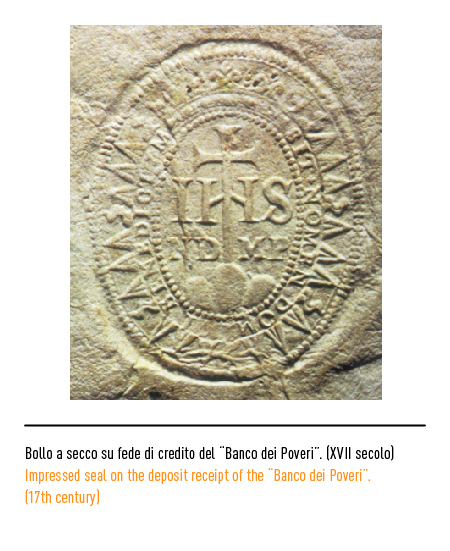 The "Monte di Pietà" banks were founded by benefactors who were members of the aristocracy and merchant class in an attempt to protect the poor from the evils of usury through interest-free loans against a pledge. 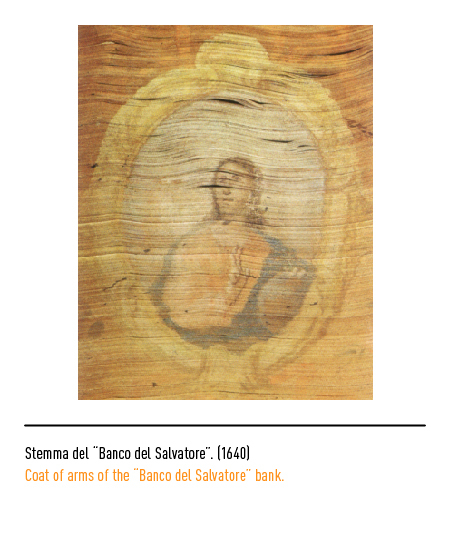 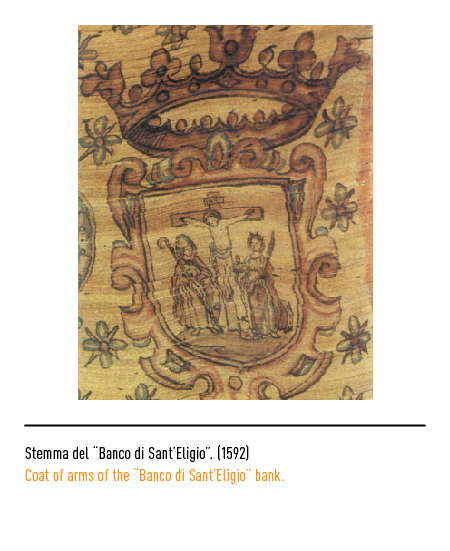 Be it as it may, tradition has it that the Banco di Napoli slowly grew out of the century-long merger of eight banks, namely: the Sacro Monte di Pietà (1539), the Sacro Monte dei Poveri (1563), the Banco della Santissima Annunziata (1587), the Banco di Santa Maria del Popolo (1589), the Banco dello Spirito Santo (1590), the Banco di Sant'Eligio (1592), the Banco di San Giacomo e Vittoria (1597), and the Banco del Santissimo Salvatore (1640). 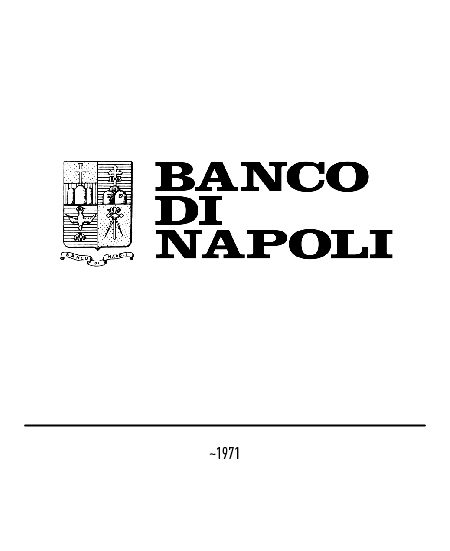 In 1794 Ferdinand IV of the Bourbon dynasty merged all these charitable "pawn broker-like" banks of Naples to form the "Banco Nazionale di Napoli". 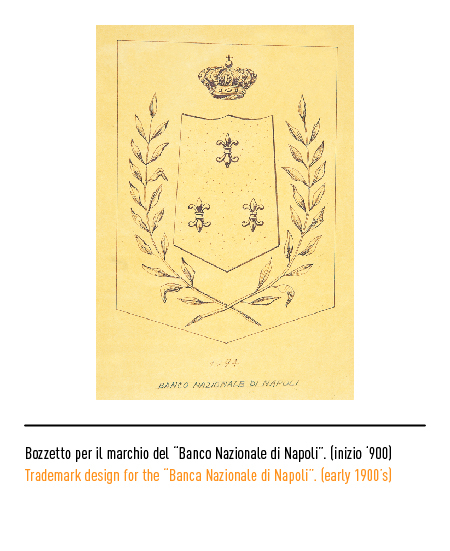 Mergers and suppressions continued under the Napolelonic government of Gioacchino Murat and the remaining "banchi" of this sort were finally reunited under the "Banco Nazionale delle Due Sicilie" in 1809. 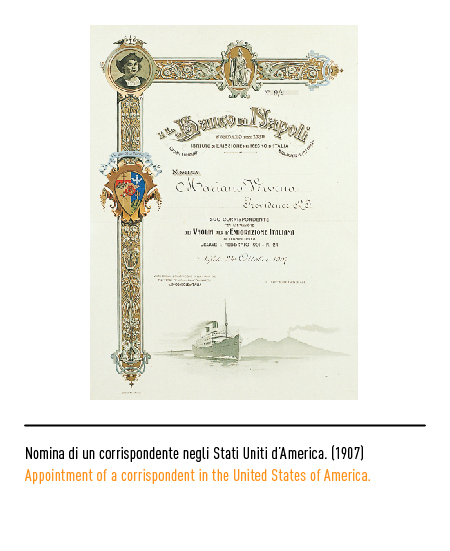 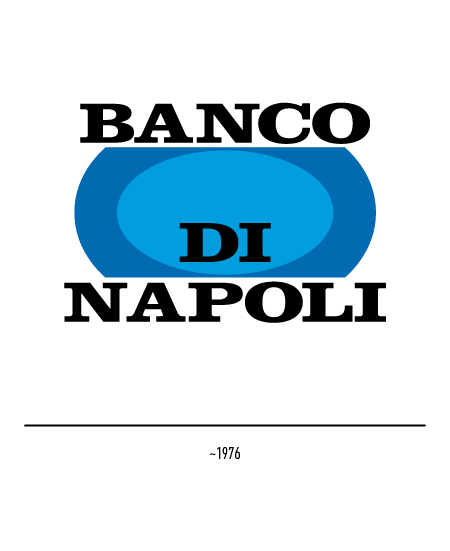 This bank then acquired the name by which it is known today, "Banco di Napoli", in 1861 with the proclamation of the Kingdom of Italy. 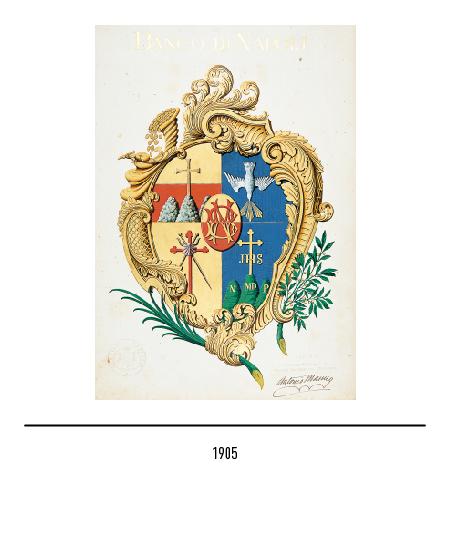 Its escutcheon was officially filed in 1905. 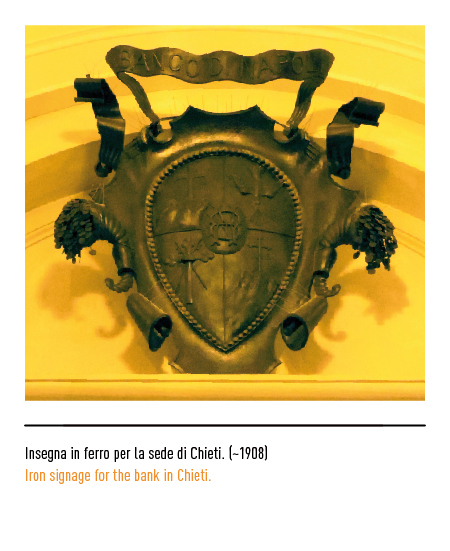 It was essentially derived from the integration of the iconographic legacy of only four of the former people's savings and loans banks, whose armorial devices appear stamped on the spines of the ledgers. 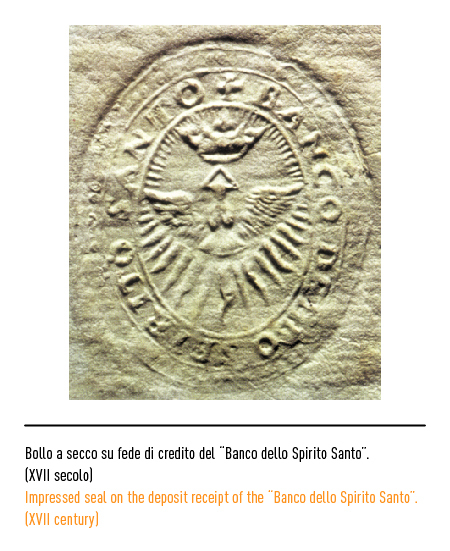 The Calvary Cross atop three mounts against a yellow and red background is emblazoned in the first top left-hand quadrant (the former arms of the Sacro Monte di Pietà); a flying silver dove symbol of the Holy Spirit, with golden rays issuing forth from its beak and shown in reverse against a light-blue background embellishes the second quadrant (the former arms of the Banco dello Spirito Santo); Saint Iago's long and pointed sword in the shape of a tri-foil cross traversed by a pair pilgrim's staves and surmounted by a sea shell against a golden background adorns the third quadrant (the former arms of the Banco di San Giacomo); a tri-foil golden Calvary Cross with the JHS monogram, all atop three green mounts with the letter "M" for "mons", "P" for "pauperum", and "ND" for "nomine dei" against a light-blue background garnishes the fourth and last quadrant (the former arms of the Monte dei Poveri del Sacro Nome di Dio). 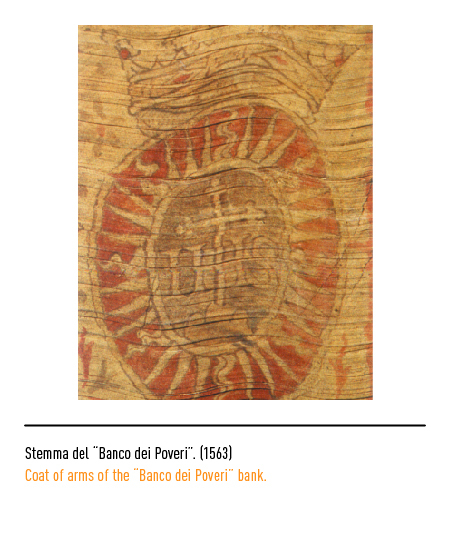 This intricate device was surmounted by the monogram BN with intertwined lettering in an oval figure against a yellow and red background. 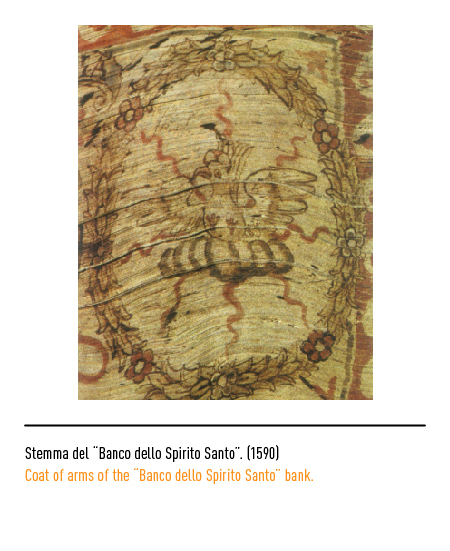 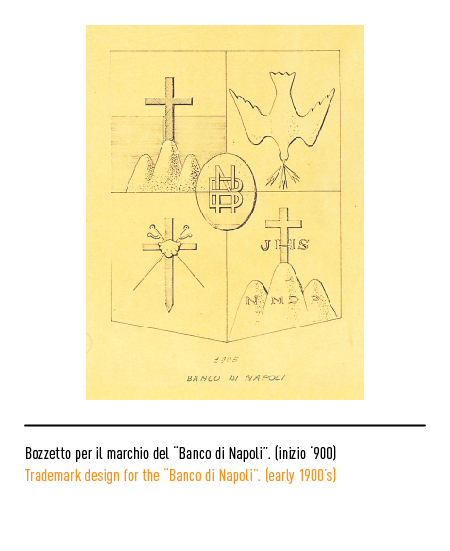 In 1947 a Sannite-style shield and a flying festoon with the wording "Banco di Napoli" imprinted on it were introduced. 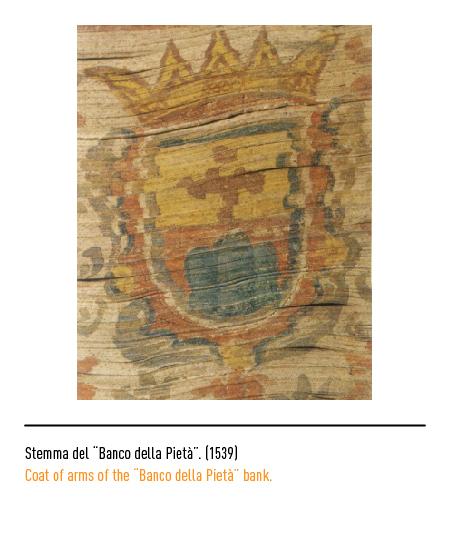 The quadrants were also rearranged, probably for colour-matching reasons. 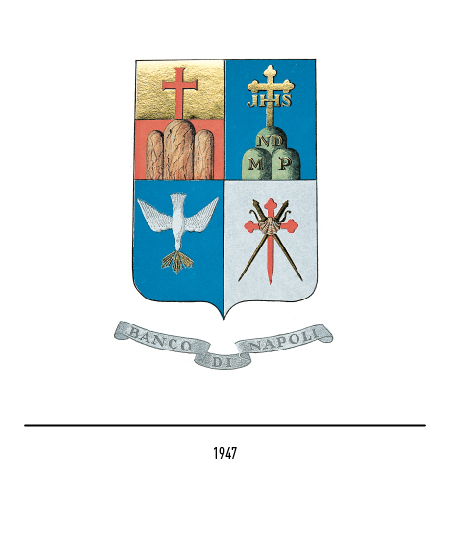 As their were no strong restrictions governing the use of the trade-mark, the coat-of-arms was freely used in the seventies in conjunction with the logotype in Egyptian-style lettering, that is with squared and weighty serifs. 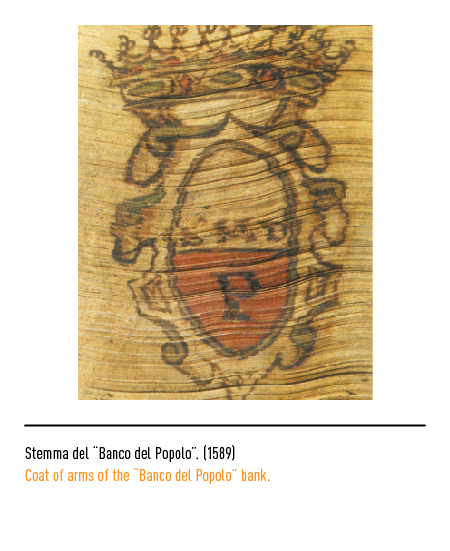 The logotype was sometimes used on its own. 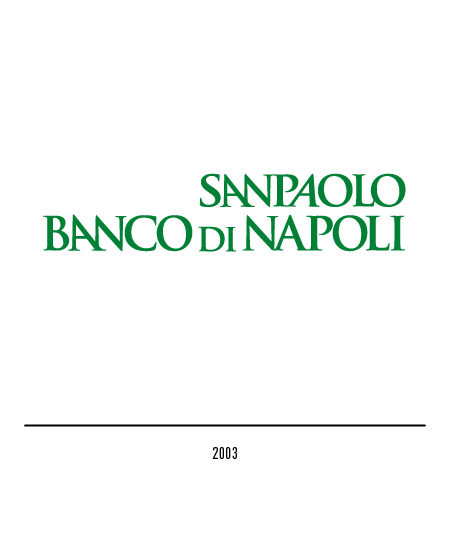 In 1989 the Banco di Napoli decided that its image required overhauling, beginning from its trade-mark. 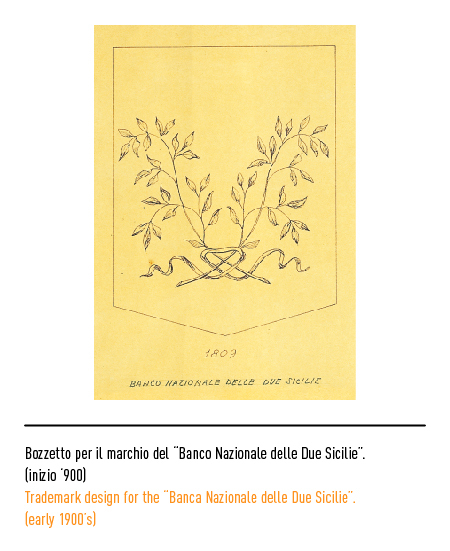 While retaining its traditional and distinctive heraldic character, the trade-mark was appropriately modernised and stylised and set in an oval-shaped figure defined by modules set one off against the other, thus giving a new lease of life to the these time-honoured symbols. 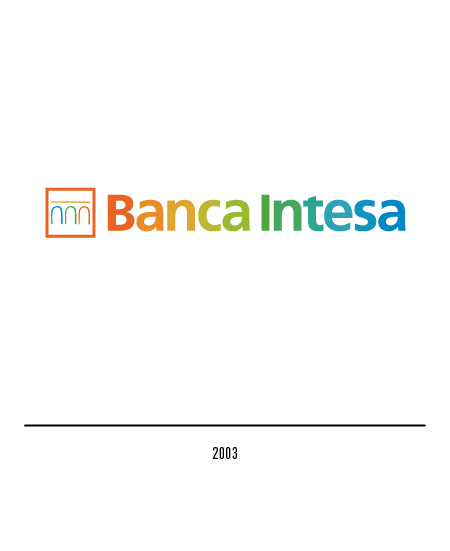 The logotype was also changed with Carla-style lettering. 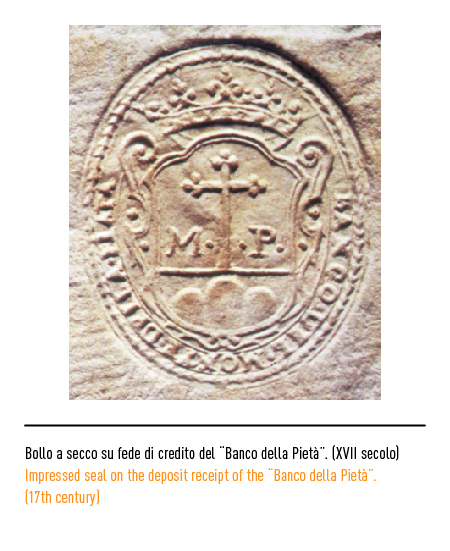 The 1947 trade-mark is currently in use with the Bank's Historical Records Office. 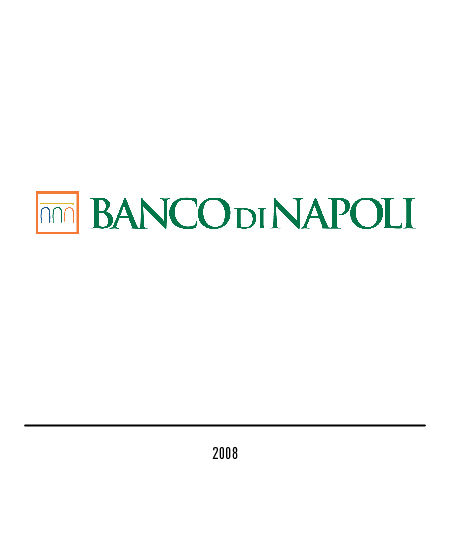 In 2003 San Paolo incorporated Banco di Napoli, this is the reason why its corporate identity has lost its peculiar historic symbols; for the new logotype Trajan-lettering has been used, it has been appropriately modified to look like San Paolo logotype. 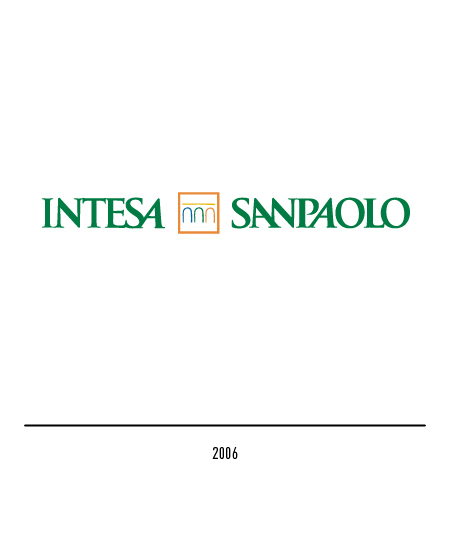 In 2007, after the blending between Sanpaolo Corporation and Banca Intesa corporation. 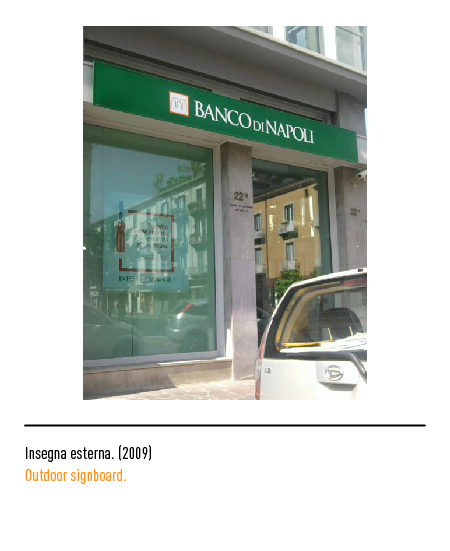 The Banco di Napoli found itself in a much broader corporation than ever before, both on an international and national level. 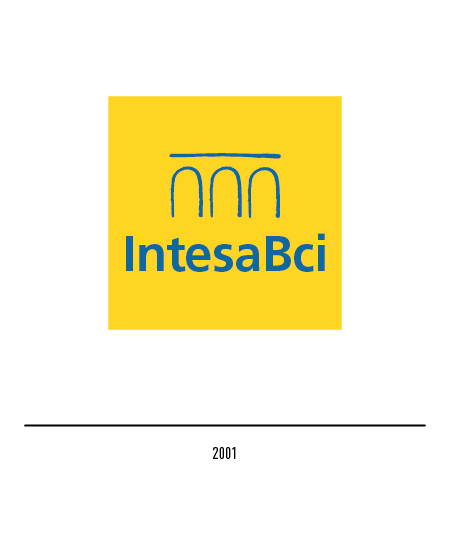 In 2007 the bank reacquired the old denomination along with what used to be the logo for Intesa San Paolo, or the three colored arcs belonging to an aqueduct, a firm rock building symbolizing dynamism and development. 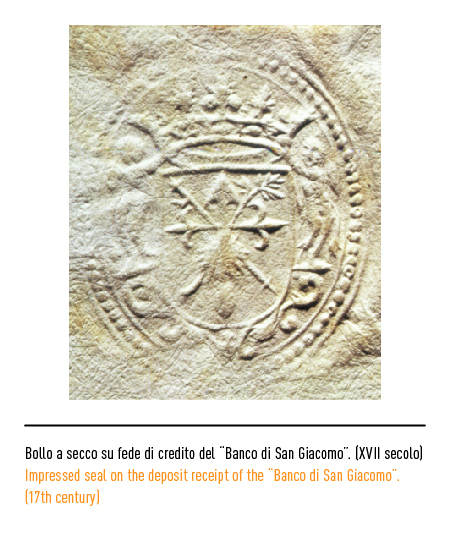 Archivio Storico del Banco di Napoli. 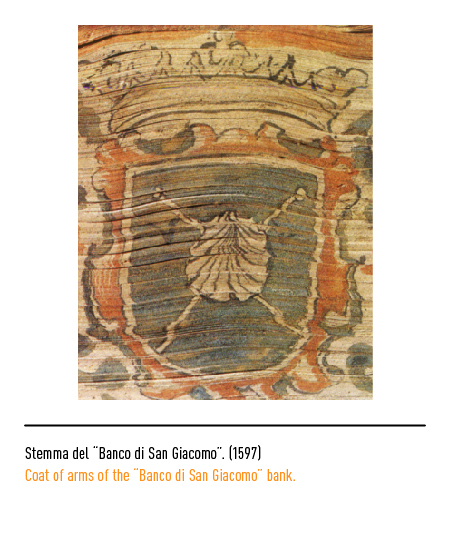 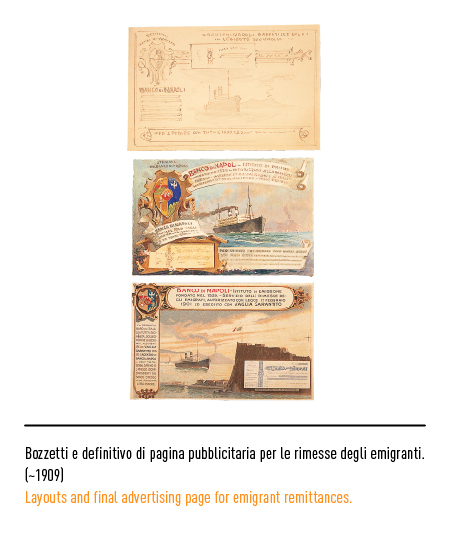 MOSTRA PERMANENTE DI DOCUMENTI DELL’ARCHIVIO STORICO, Istituto Banco di Napoli, Napoli, 1996. 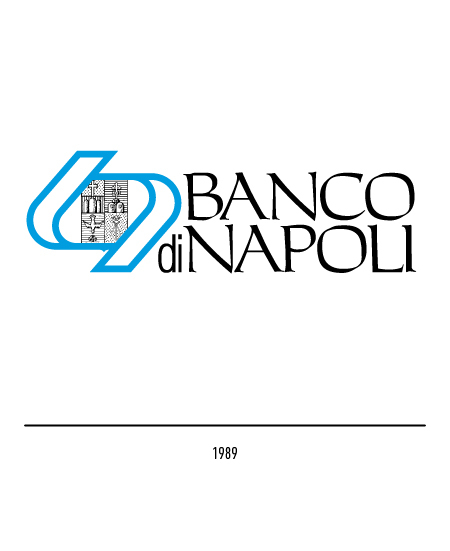 L’ARCHIVIO STORICO DEL BANCO DI NAPOLI, Istituto Banco di Napoli, Napoli, 1998.